Yet Another Upcoming BlackBerry Smartphone: Codename Essex is Next Revision of Niagara (Tour)?! Word of the BlackBerry codenamed "essex" has been making its way around the interwebs for the past 24 hours, starting off in our very own CrackBerry forums. 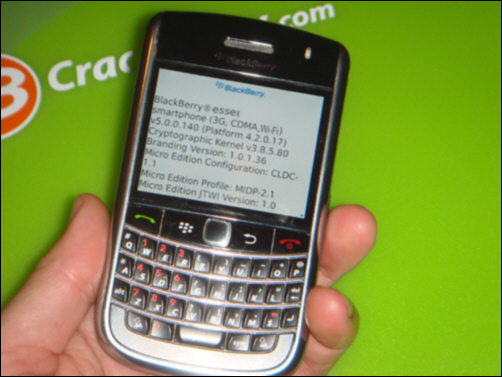 The codename name isn't actually new - back in July when I did a forum re-shuffle I actually added the essex codename to the Other Rumored Devices forum description - it was a name that had come up a few times since WES in BlackBerry discussions. With the device moving along in RIM's development cycle, more details have now emerged about essex which is slated to be the next iteration of the BlackBerry niagara, aka the BlackBerry Tour (thanks salo!). With the BlackBerry Tour barely out on the market, it seems a bit crazy for the shape of its successor to already be taking form, but essex's revisions are addressing the few complaints current Tour owners have. Mainly, essex will include Wi-Fi and the new touch sensitive trackpad that is found on the Curve 8520. And it will be a global phone with roaming between CDMA and GSM/GPRS/EDGE/UMTS networks. Camera is slated at a minimum of 3.2 megapixels, screen resolution is 480 by 360 pixels and we're hearing the device may just feature an orientation sensor to boot. As always in the world of BlackBerry, all will be known in time. My only wish is that we could have skipped niagara and went right to essex - I want this device a month ago!! In fact, I wantz this device so bad I just photoshop hacked one into my hand!